There is this very odd feeling, after you experience something very sad or very intense, as if your regular life isn’t quite fitting right. Very normal things really feel odd. I think that’s been the weirdest part for me. I am kind of determinedly having a very normal morning. The youngest is off at Saturday School playing Breakfast Club, the oldest is off at a sleepover and I am having some tea and quiet time with the dog and the kittens. It’s been a lot of heavy and no knittin’ on the blog the last few days and part of me feels like I ought to apologize, but I’m not gonna because, as I said to someone else a few weeks back – as a rule, people read these things because they are interested in the person writing them and that includes the very real stuff and not just the yarn. So it’s been real. 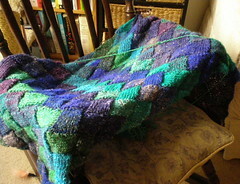 And now there is some yarn. We really are at the “This is the Stole That Never Ends” point with Lady E. I’ve got 3.5 skeins to go, out of the original 10. That is some knitting accomplished there. Last night I pulled it out of the basket and put another two tiers in. 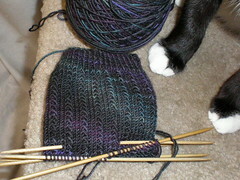 The kittens, Tiki and I watched Dr. Who and Battlestar Galactica while Mittens enthusiastically made biscuits on the part I wasn’t knitting. I am going to have to wash this in Soak before I give it to the person I am making it for, he got one corner a little moist with kitten spit. I’m going to be focusing on this till it’s done now. I have to finish it so that I can get started on…. Kayla’s Baby Surprise Jacket. Stopped in at A Mano Yarn Center yesterday to pay for my Stitch N Pitch tickets (they’re almost gone, you should get yours!!!) and this Manos Stria leapt into my arms along with the Elizabeth Zimmerman book. Yes, it was post cat retail therapy. Something soft and pink and hopeful was just what I needed. And there’s been a little spinning off and on as the mood strikes me. Took my new Kromski lace flyer for a test drive and this is what I’m getting. I think these singles may be a little underspun but we’ll see when I get to plying them up. I’ve been struggling with the difference between “yarn” and “twine” but know that eventually I’ll get it right. 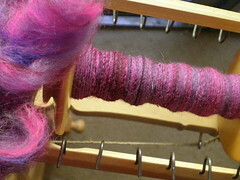 This is spun up from some batts I got off Enchanted Knoll on Etsy. 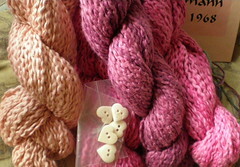 They are “Hot Mama Batts” and include alpaca, silk, cotswold and glitz. Also, some dog hairs and maybe cat hair, but we added that here, it wasn’t part of the original batt. Really fantastic to spin up. Soft, fun, the colors are amazing. And is there ever NOT a sock? No. There is always a sock. Another Charade, in STR lightweight RookY. Life goes on. It just does. You wake up and there is hot tea and a sleepy dog and the kid needs to go to school and maybe you have to work later, so you just get on with living it and take a deep breath when you need to. I think maybe that is the biggest thing I’ve learned as I get older. Life goes on. It doesn’t stop. It doesn’t slow down. If you blink, you will miss it. I would like to give you a big hug. But I will content myself with sending good thoughts today. You definitely deserve some pretty yarn and some quiet time after the few days you’ve had.. also.. I love the kitten paws in the photo!! I know what you mean about the odd feeling. But life does go on. Egggsactly! And sometimes the fact that it goes on is a W-itch. With a B. Sorry about the kitty. That’s so hard. We lost two of ours in rather quick succession in the last year and a half, one we found in the kitchen when we had been out having a picnic in the back yard, very upsetting. And now our older cat that we brought from New York is suddenly losing weight and acting very aged. The weirdest thing to me is that my DH and I have been together long enough for a kitten we got together to be old. I spent a year iun Denmark and talked to some folks about life under the Nazi occupation. “What did you DO?” I asked.